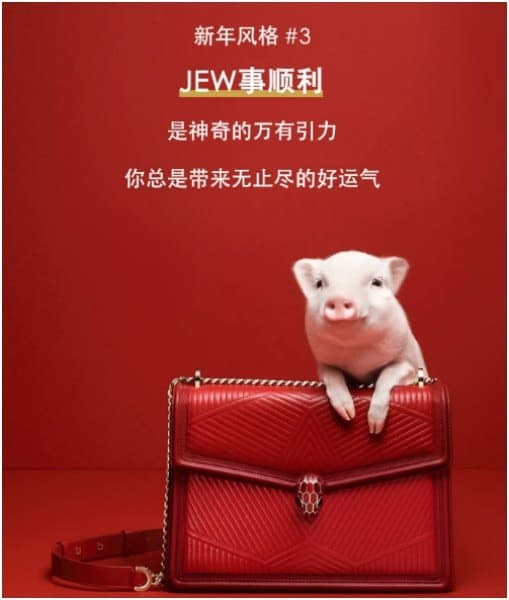 A new marketing campaign by Italian luxury brand introduces “JEW” as a supposed ‘buzzword’ for the Year of the Pig (Zhu in Mandarin. 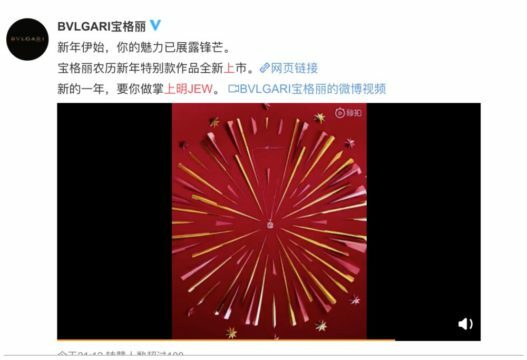 On January 4th, the Italian jewelry company Bulgari launched a remarkable campaign on WeChat and Weibo to promote its luxury goods for the New Year, which for China, will be the Year of the Pig. The word ‘JEW’ is multidimensional in its Chinese use here by Bulgari. (1) Firstly, it is a wordplay on the Mandarin pronunciation for ‘pig’ (猪) zhū, which, when pronounced, sounds similar to the English ‘Jew’ (listen here). 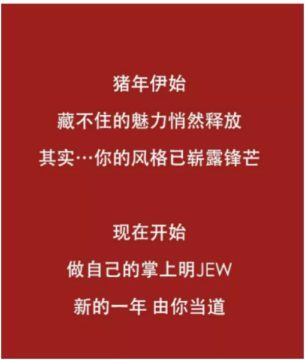 (3) Third, the campaign uses various Chinese idioms starting or ending with a character that is pronounced as ‘zhu‘ in Mandarin, where ‘Jew’ is used as a substitute. It is a play on words, as it could mean either ‘pig,’ ‘jewelry,’ as well as still conveying the meaning of the original idiom. The Chinese idiom “pearl in the palm” or “beloved daughter” (掌上明珠, zhǎngshàngmíngzhū), for example, is written as “掌上明JEW”: it sounds the same, but the last character is replaced with the English ‘Jew,’* which then also changes the meaning of the idiom to something along the lines of “having a jewel in the hand” – which is used to promote a Bulgari watch. The Chinese idiom 胸有成竹 (xiōngyǒuchéngzhú), meaning to have a well-thought-out plan, is used in combination with ‘Jew’ here, which also gives it a double meaning since it could then literally be translated as “your chest turns into jew[elery],” which is used to promote the necklace in the first picture. 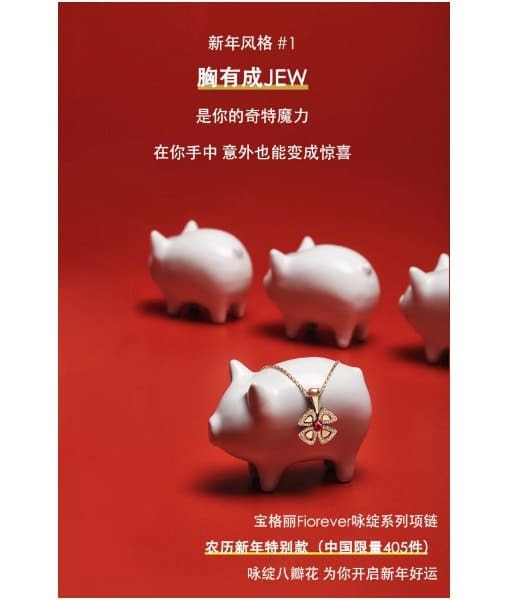 Another idiom used in the campaign is 诸事顺利 (zhūshìshùnlì), which means that everything is going smoothly, and in which the first ‘zhu‘, again, is replaced by ‘JEW,’ which brings about a wordplay that the Bulgari jewelry is supposedly smooth, as well as the [year of the] pig. All in all, one could argue that Bulgari’s marketing team has created a new marketing campaign that mixes up Chinese characters, English, and idioms in such a way that thinks of Chinese tradition and promotes their own luxury products. 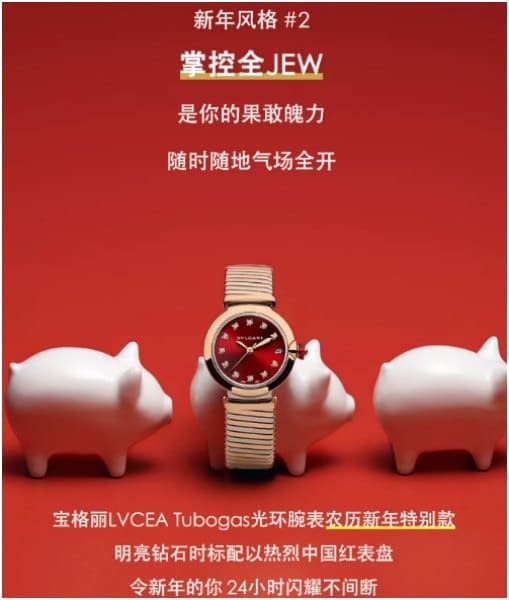 However, as Nathan Baker notes, there is a sensitive problem in this campaign regarding the use of the word ‘Jew,’ especially when framed together with the images of a pig, which will surely raise more than a few eyebrows and, marketing-wise, is probably not a smart move for the Italian luxury brand. Update: Wow, that was fast. The campaign already seems to have been deleted from Wechat as well as from Weibo.